This little plant is probably known more as a 'weed' than a wildflower because of its invasiveness and its ability to spread rapidly. However consider Ralph Waldo Emerson's definition of a weed: A plant whose virtues have not been discovered. Found in cultivated and disturbed ground, it's a small, raggy little annual with cylindrical 10mm long heads of yellow disc florets only (4-5mm across), rarely are ray florets present. The ends of the greenish bracts surrounding the flowers are tipped with black. The leaves are pinnately lobed, the lower being stalked, the upper stalkless. 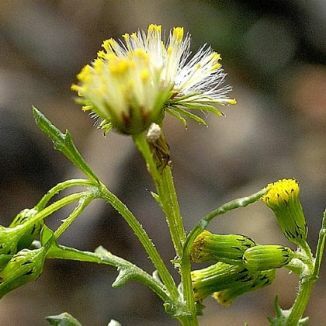 Groundsel flowers throughout the year, even surviving hard frosts, and when it sets seed, the seeds are held in a pappus which then breaks up, distributing the seeds far and wide. It is a native plant and is a member of the family Asteraceae. As a child, I first knew this little plant as food for our budgerigar and there was no shortage of it in our garden in Dundrum, Co Dublin! I photographed it in Gibletstown, Co Wexford in 2005. Groundsel has a place in our folk lore. 'A little plant called groundsel was a good cure for a head ache'. From the National Folklore Collection, University CollegeDublin. NFC S.454 :113. From Co Kerry. 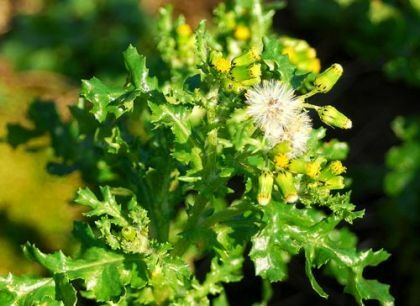 The name 'Groundsel' came from the Old English 'gundeswilge' from 'gund' meaning pus and 'swelgan' meaning to swallow from its use in poultices. The genus Senecio derived from the Latin senex (old man) for its head of white hair or pappus.